Crater Lake National Park was the destination for Day 61 of our 71-day bicycle ride from New York City to San Francisco. There were 20 members on the 2014 Illini 4000 team, making our way across the country on bikes to raise money for cancer. We woke up the morning of July 24th in Crescent, OR at the RV park where we had spent the night camping in tents. It was cold overnight so we got to sleep in later than our usual 5:45 a.m. wake-up time to wait for the temperature to rise a bit. The weather ended up being perfect that day: temperatures in the 70s, sunny skies, and no headwind. After heading south out of Crescent on US-97 and west on OR-138, we entered Crater Lake National Park through the north entrance gate. 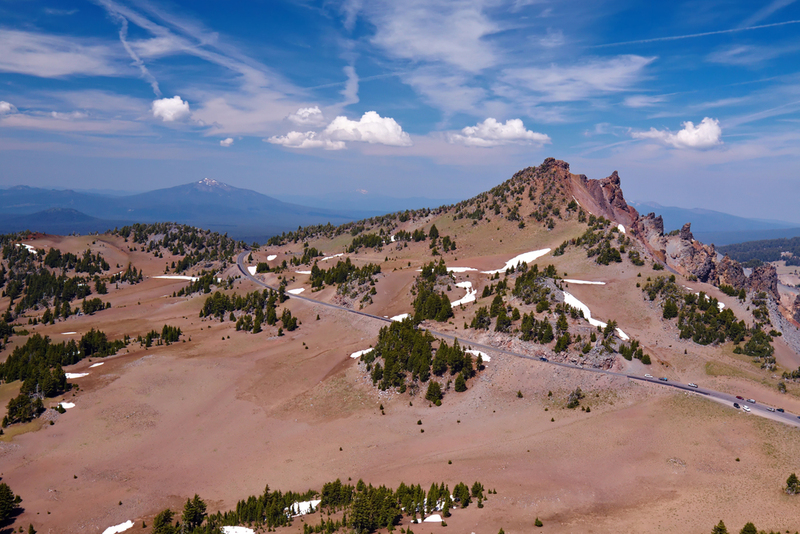 From there, we knew we had about 10 miles of climbing ahead of us until reaching Crater Lake. While it was not the easiest of rides, the scenery throughout the park distracted us from our tiring legs. Large parts of the road were lined with pine trees. When the trees cleared, we had terrific views of mountains. We went through the Pumice Desert, which seemed out of place, both for its flatness (which we enjoyed) and the sudden lack of trees and greenery. We slowly made our way to the top, growing more anxious to see Crater Lake (and to eat our peanut-butter and jelly sandwiches). We made our way around a curve and finally saw the first parking lot and overlook. We had a strange satisfaction upon seeing the cars in the parking lot, knowing we had worked our way to the top to see the Lake while others had driven. Maybe it was the taxing ride up or maybe it was the high elevation, but Crater Lake was truly breathtaking. There were mountains all around and the water was unbelievably blue. Once there, some of us took the opportunity to explore and hiked along some of the trails. Others took the time to relax and enjoyed the view from where we were. All of us took so many pictures, but nothing we captured on our cameras came close to doing justice for the beauty of Crater Lake. After taking a much longer-than-usual rest stop, we felt the temperature start to drop and decided to make our way to Mazama Campground to set up camp for the night. Luckily for us, the rest of the ride was all downhill. That night, after the sun went down, we were treated to yet another beautiful sight: the night sky. Light pollution was low, the sky was clear, and the stars were endless. We got the campfire going, cooked hot dogs and s'mores, and danced under the stars. Thank you Ellen for your submission! We love hearing people's bicycling experiences in the Parks. If you have a park ride to submit you can share your story here! 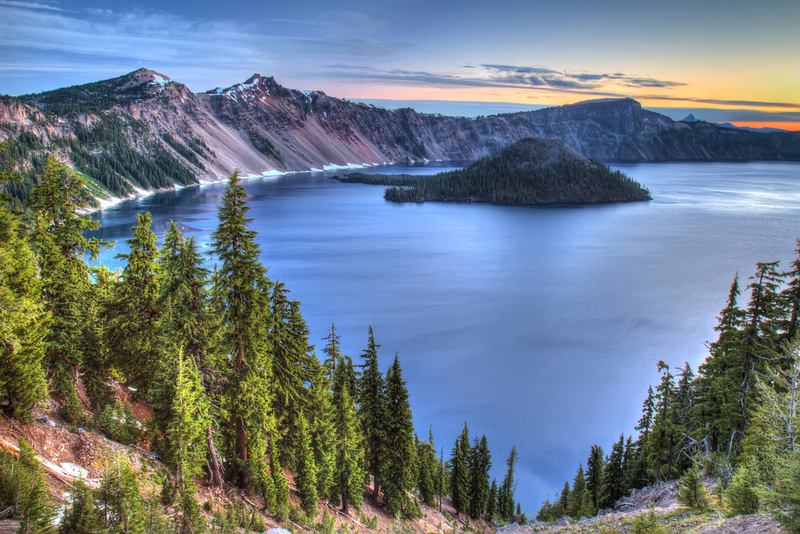 The 33 mile rim road that circumferences North America's deepest lake, topped Bicycling Magazine’s “Dream Rides” list. This paved road is almost never flat and is well suited for road bikes and long distance junkies. It is shared with vehicle traffic with the exception of car-free days that the park puts on each year. 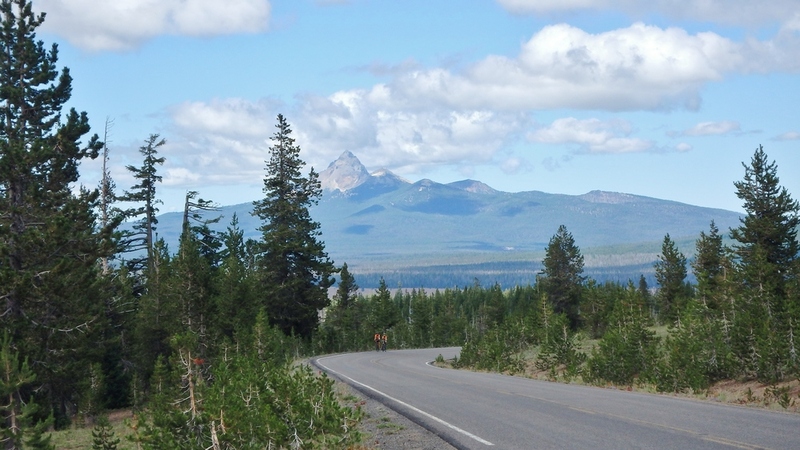 Due to the elevation, there can be snow here any time of the year, though late spring through early fall is generally great for visiting and cycling. The town of Ashland, Oregon which is approximately 1 hr 20min drive from Crater lake has numerous bike rental shops, among them Bear Creek Bicycle which is well stocked and well reviewed! Have more info about this Park's rides? We'd love to add more photos and info. Please click on the "share your ride" page to contribute more info!